Review: Black Beauty meets The Red Violin! I don't know what it was about the previews, but I eagerly awaited the coming of this film. Hubby had no interest, but ended up going with me and loved it. Older audiences will be reminded of great classics like My Friend Flicka, Black Beauty, and Old Yeller. And because the film follows not only Joey's adventure but Albert's father's regiment flag, as well as the encapsulated stories of those Joey meets, the film was very reminiscent of the captivating film the Red Violin. 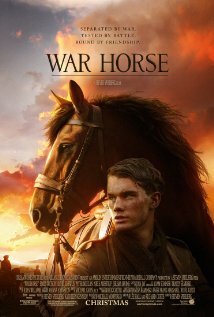 The film is a coming of age tale showing the courage of animals and people, of hope and loyalty. Between the goose, Joey, and the major's black horse, the animals steal the show. The acting was also superb from everyone present. Some of the best scenes were those without dialogue - where a look or a simple gesture conveyed volumes. Very nicely done. The locations are fabulous. The sets for the trench warfare and no man's land will make you feel like you are there. Some truly majestic and sweeping camera work. Definitely worth a watch, with or without the kids. I Won the Kreativ Blogger Award - Squee!